Locational Advantage : GRT Grand is located in the center of the city near the Teynampet junction just off Anna Salai. GRT Grand, the first ISO 9001 and HACCP certified hotel of India, is an ideal place to stay in Chennai. The hotel is located close to the city center and other places of interest, making it convenient for the guests to travel within the city. As the hotel proffers a wide range of services, it is equally suitable for the leisure as well as business travelers. 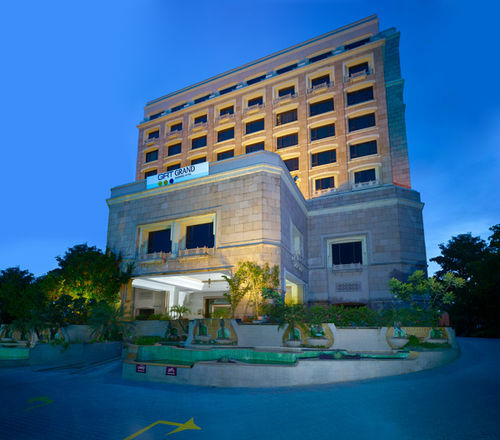 In short & snappy terms, GRT Grand is a luxurious hotel that makes the preferred choice of travelers to stay in Chennai. The hotel offers accommodation in its 133 spacious and well-furnished rooms, categorized into Theme Suite, Deluxe Suite, Grand Club Room, and Superior Room. Each room is gracefully decorated and is equipped with all the amenities. Copper Point: A restaurant that serves delectable delicacies from Indian cuisine. Any Time: A 24-hour coffee shop that serves delicious snacks and beverages. High Time: A stylish bar that offers the finest blend of wines and selected drinks. Beauty Salon, Courier Service, Credit Cards Accepted, Doctor on Call, Fax, H/C Running Water, Money Changer, Newspaper, Room Service, TV, Direct Dialing STD/ISD Facility, Safe Deposit Box, Internet Connection, Outdoor Swimming Pool, Laundry, Travel Desk Service, Conference Facilities, Banquet, Health Club, Parking, Bar Facility, Multi-cuisine Restaurant, Car Rental, Secretarial Assistance, Reception, Business Centre, Postal Services, Coffee Shop.